Breathe in the refreshing air of the mountains in this sixty minute trek! 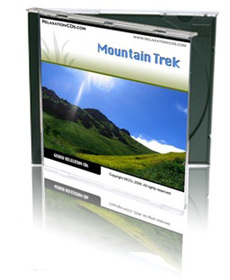 If it feels as though you have a mountain to climb, give yourself a well-deserved break with this super-relaxing CD. With the aid of our guided visualization, you’ll picture yourself on an invigorating mountain trek. Your journey will take you through tropical rainforests, where tree ferns sway and exotic birds swoop and call. As you ascend higher you’ll pass crystal-clear mountain streams and sparkling waterfalls. And when the CD brings you safely back home again, you’ll know that the mountains you thought you had to climb are really no more than anthills. Relaxed, empowered, energized, you’ll be ready to hit new peaks in no time at all!